In early June of 2011 a cow moose was killed in a vehicle accident near Pembroke. 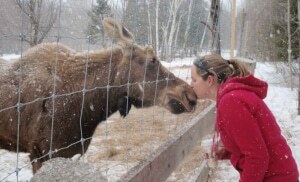 This resulted in the orphaning of two three week old moose calves, which were transferred to Haliburton Forest. Chances for their survival were very slim… and in fact one of the calves died within hours of arrival. However, the second defied all odds … and to this day developed splendidly! In the meantime, the calf, which arrived as a female, turned out to be a young bull … and with all the confusion, the back and forth, is it a “she”, a “he”, a “him” or “her”, the name “Hershe” developed. Today Hershe is roaming a spacious 4 acre treed enclosure with 2 ponds which can be visited at the Base camp. Hershe enjoys company, be it horses, humans or dogs and consumes over 50 lbs of fresh leafs and twigs on a daily basis. 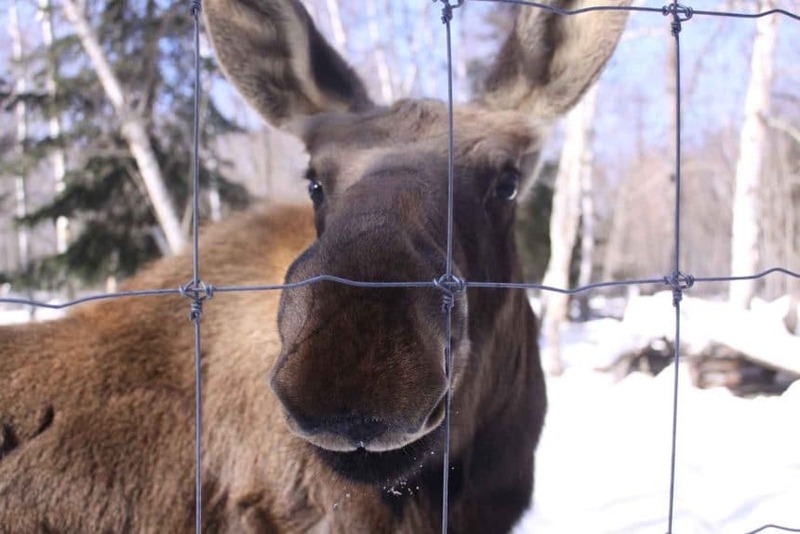 There are 4 sub species of Moose in North America – the Yukon/Alaska moose is the largest, the Shiras Moose, the Western Canadian Moose and the species found in Haliburton County – the Eastern Canadian Moose.